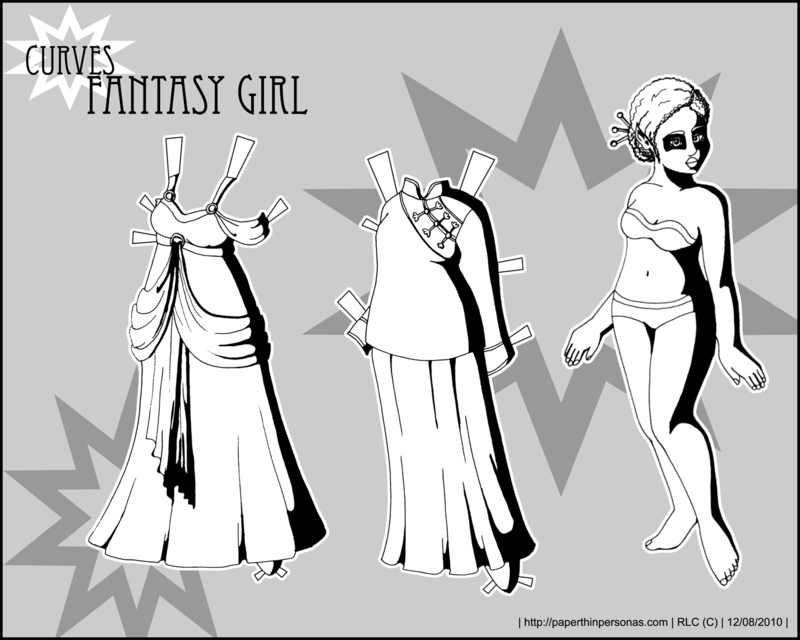 Originally, I drew this paper doll to try to draw things I really wear on a regular basis to work, though I ended up sort of modifying them both since my standard work attire just isn’t that interesting. It’s cold out today with frost and snow on the ground. The sun has been setting early- though I know it’s past the solstice- it seems dark. I find I sleep more when there is a lot of darkness. School hasn’t restarted yet, so I’m working full time to make up some missed hours and spending a fair bit of time working on things for the site. I’m trying to end up ahead of the curve for the next year and not behind it as I usually am. Of course, we know what they say about good intentions and roads to hell. So, speaking of good intentions, I have been thinking a fair bit about goals for the upcoming year. Some of my goals for the blog are concrete like getting my Gallery page up and running (which should be up, fingers crossed, on Friday) and trying to post at least once a week even if it is a filler doodle. 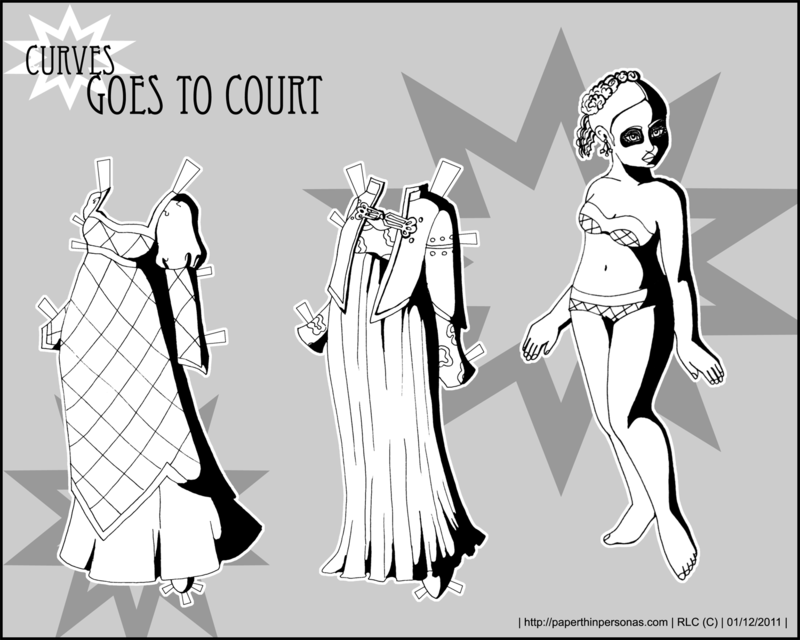 Other goals are more… abstract- like trying to do things with my paper dolls that scare me. 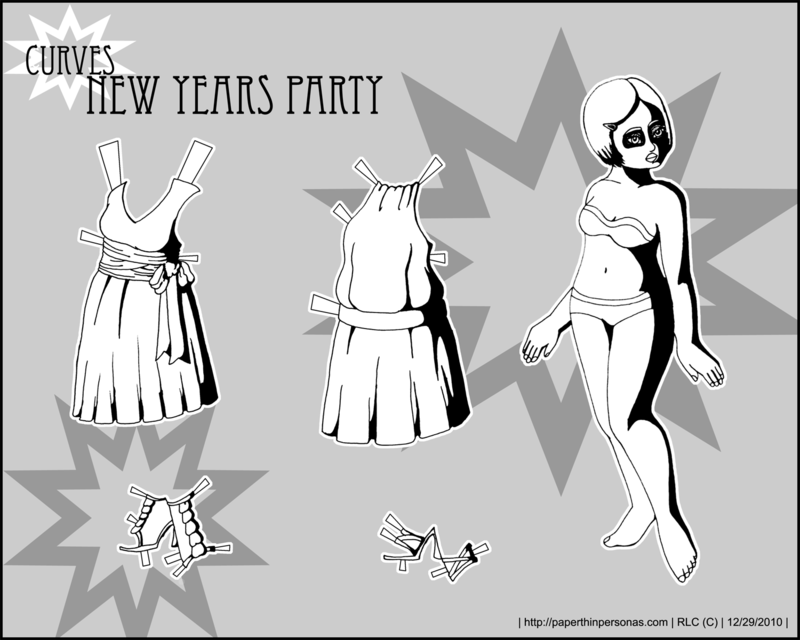 A year ago, I never would have through I could really do a weekly full color paper doll and now I have two (Marisole and Pixie), or that I would end the year having posted 106 paper dolls here on PTP. I’m proud of those achievements, but there’s so many other things I’m afraid of- shiny fabric, hands, figure drawing, draped fabric, animals, any kind of mechanical object or furniture, shading in photo-shop, color in physical mediums… the list is long. So, my other goal is to do one thing that scares me every week. I’ve really been enjoying Liana’s posts over at her blog lately. I love that she’s making them more substantive. I always want to do that with my posts, but I also feel like I don’t have a lot to say. There is, also I suspect, a fair bit of general tiredness thrown in there. By the time a paper doll is ready to post, I am usually tired and not very interested or capable of writing intelligently. It is something I am trying to work on. On that vein, I would like to bring up one of my favorite websites which is Arabella Greyson’s site. Considering some of my other favorite websites are Go Fug Yourself and Jacket Magazine, it shouldn’t surprise anyone I have a soft spot for Greyson’s site which includes a selection from her collection of black paper dolls along with articles about her collection and about the question of race in relation to paper dolls. I remember reading about the famous baby doll experiment done by Kenneth and Mamie Clark in the 1940s and being fascinated by how children internalize the messages of toys. Though the more I read about it, the more concerned I become about the internal messages of my own paper dolls… then I remind myself not to over think these things. 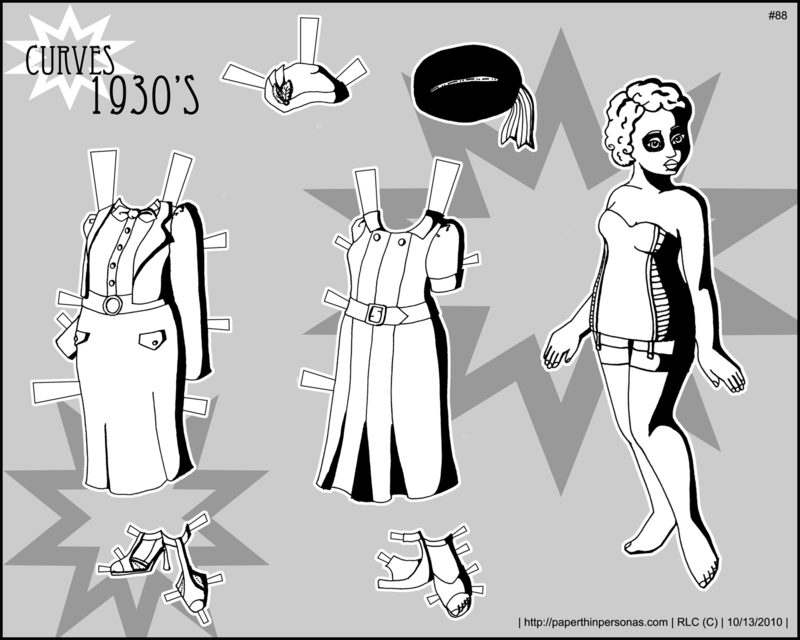 I do love vintage fashion and though the 1940’s are not my favorite period, I drew this set of paper dolls around the same time I drew last weeks Curves post. 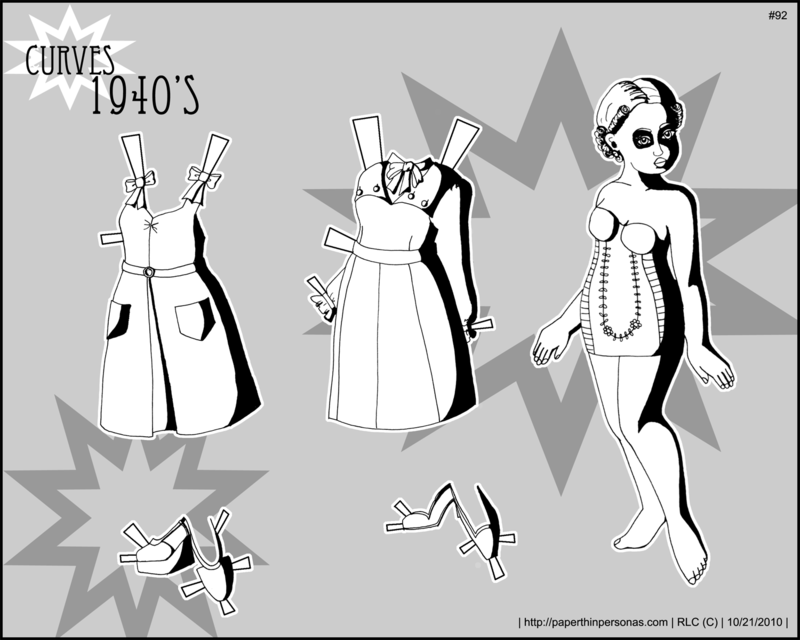 In fact, it was exactly the same time, as with that post I used the Vintage Fashion Wiki to find pattern covers from the 1940s and then drew them. Though I like the way it turned out, I am the first to confess that my interest in 1940’s costume can be linked entirely to my love of Foyle’s War another fantastic BBC drama. I love BBC dramas much more than I should. Plus I can get them from the library for free which when you’re a starving graduate student is a lovely advantage. To be fair, I’ve also been watching a great deal of The X-files, but I doubt I am going to drawing 1990’s suits a la Dana Scully. I’m just not that much of a fan of early 90’s suits. I sort of collect historical costume and vintage fashion resources around the web. One of my favorites is The Vintage Patterns Wiki full of pattern covers from the 20th century. From there, I found the wonderful blog What I Found where the author had posted a Simplicity Simplicity Fashion Forecast – 1937 advertising book. It’s wonderful. Curve’s paper doll costumes both come from this lookbook from the era- one smart suit and one summery casual frock. Her shoes are based on illustrations in John Peacock’s book Fashion Accessories. I’ve been drawing a lot, but not posting a lot which is rare for me. Usually, I’m struggling to keep up with the blog and come up with ideas. Lately, all I’ve been wanting to do is draw and when it comes time to scan or color, I just sort of go, “Meh”. I think it’s because I find drawing relaxing and posting is more like work. Anyway, today’s Curves is going up and on Friday there will be a Florence (one of the last Florence’s I suspect) and starting in November there will be a new Fashion Doll Friday paper doll, of style I don’t know yet. Maybe I’ll put it too a vote.